The youngster left Manchester City for the Bundesliga outfit in August 2017, and he has proven a huge success thereafter with a combined 30 goals and assists across all competitions. According to Standard Sport, United are keen on luring the attacker to the Premier League this summer and they are confident of doing so with a bid of around £80m. It is added that arch-rivals Manchester City won't be able to prevent them from signing the attacker with no United clause available, though the Citizens will make a decent profit by means of sell-on fees. 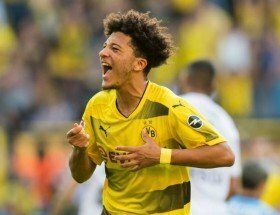 Sancho, who has more than three years remaining on his Dortmund deal, has also been linked with the likes of Paris Saint-Germain this month, though he is said to prefer a return to his homeland. The teenager is currently with the England side for the forthcoming European qualifiers against Czech Republic and Montenegro. He has a good chance of starting both games with Marcus Rashford struggling with an injury.